Ananka's Diary: Congrats . . .
hi kirsten you rock! so much i love your blog and i think you rock! Thank you sooooooo much! I love you! And your books! You are one of the people who inspired me to write. You are my favorite author and this means sooooo much! Thank You!! Rosemary Solomon; I am homeschooled and it's nothing special except for the fact that there is no social interaction. Which is good for me because I am 'strange and unusual.' Who can guess where that line came from? Hint; It is from a movie. WOW!! i love the picture. so i was just wondrin' where can i find the irregulars symbol online cause i cant find it and i dont like problems i cant solve and im so sorry lucy and claudia about your respective family illnesses. also i concur w/ kirsten: what the yam does does tumbl'd mean. sorry bout the what the yamming-ing. i just recieved a note in the mail from relay 4 life saying that for the event i did last year i completed 42 hrs of comm. service!!!! who knew? must be stalking me- i didnt know!!!! bye! Tumblr is a place where people post pictures (and other assorted things) they like, correct? Are those gas masks? What are they doing with old gas masks?? OMG! thank you again! I'm with Lucy now and we are so happy that the post got so many comments!And P.S Rosemary Soloman it's cool. I know ya did not mean anything and my dad just passed away so seeing all the comments is cool! Thank you RS we are fine. OMG!!! KIRSTEN, TANK YOU SOOOOOOOO MUCH FOR WRITING THE KIKI STRIKE SERIES!!! I <3 THEM! That pic is soooooo funny! 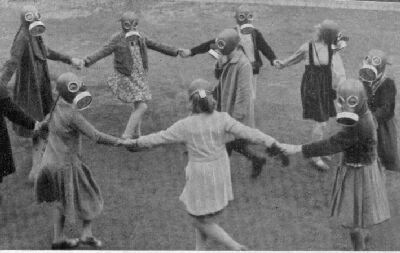 ring around the rosie in gas masks! well it kinda makes sense cause ring around the rosie is ACTUALLY a DEATH SONG!!!!!...... I NO!!! well ikk, bye!!! I <3 U! !